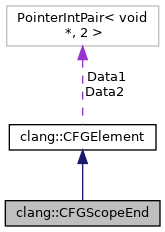 Represents end of a scope implicitly generated by the compiler after the last Stmt in a CompoundStmt's body. Definition at line 335 of file CFG.h. Definition at line 337 of file CFG.h. Definition at line 338 of file CFG.h. Definition at line 344 of file CFG.h. Definition at line 340 of file CFG.h. Definition at line 349 of file CFG.h.